After a good and warm night of rest, delicious home-cooked breakfast and a thoughtful present from an affectionate and beautiful Parvati’s daughter, it was time to say goodbyes to the magnificent Chittorgarh fort and follow the steps of Maharana Udai Singh II, who in 1568 abandoned the fort for good and moved the Mewar dynasty capital 118 kms west to a place he called Udaipur. Legend has it that Udai Singh II came upon a hermit while hunting in the foothills of the Aravalli Range. The hermit blessed the king and asked him to build a palace on that spot, assuring him that it would be well protected (you don’t have to be a fakir to understand that the Aravilli mountain range is a great natural protection by itself). 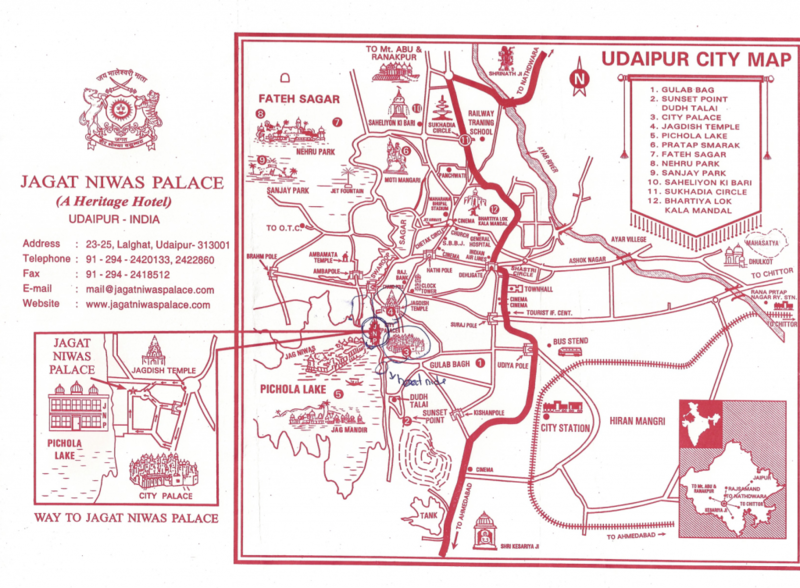 Udai Singh followed the advice and built his residency on the site and when Mughal king Akbar the Great conquered Chittorgarh, Udai Singh promptly moved his court to Udaipur. After Udai’s death in 1572, his son Maharana Pratap took the reins of power, he defeated Akbar at the battle of Haldighati in 1576 and re-conquered lost Mewar territories (except for Chittorgarh). Peace and prosperity descended on Udaipur, palaces were built on the lake shores and art, particularly miniature paintings, flourished. In 1736, the marauding Marathas attacked Udaipur and by the end of the century, the Mewar state was in dire straits and ruins. However, the State of Mewar was re-established with the help of British, who took the city under their protection till 1947 when India gained independence. Udaipur is referred to as the “Venice of the East” and in my opinion, it is one of the most picturesque cities in Rajasthan and India too. The city, which represents an attractive mix of modern and old, is located on three interconnected lakes within the town – Fateh Sagar, Pichola and Swaroop Sagar Lakes. Multiple forts, palaces, temples, havelis, gardens, mountains, narrow ancient shopping streets, along with fabulous Taj hotels occupying the former Maharana palaces, followed by the all-time high cult of the current symbolic ruler of the Suryavanshi (Sun) dynasty – Maharana Mahendra Singh Mewar – made it a perfect two-day destination. Sunil dropped me and my luggage outside the city, since there are no out-of-town cars are allowed in (or so he said), so I hired an-always-super-overprices tuk-tuk to get me to my hotel – Jagat Niwas Palace. 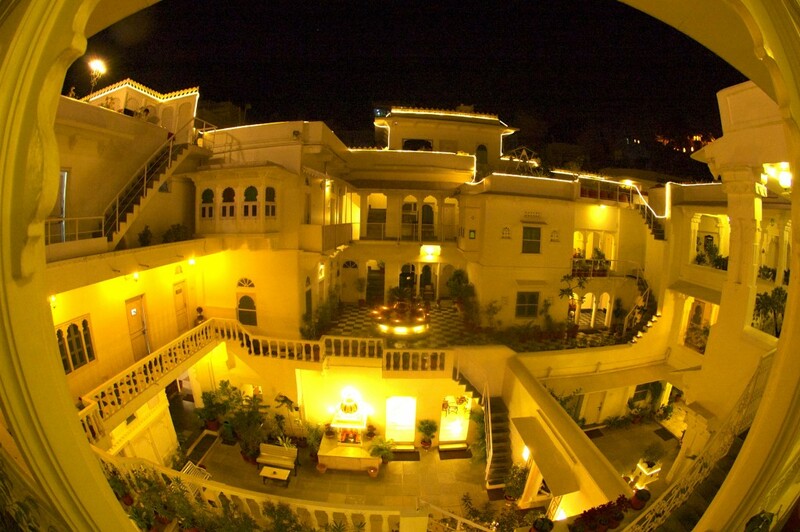 It is, no doubt, one of the best places to stay in Udaipur, unless you prefer the quaint old-world feel and luxury of the Taj Palaces hotels, which also comes with a few thousand dollars per night price tag. Jagat Niwas Palace is a beautiful historic haveli located on the Pichola lake, overlooking the Jag Niwas and Jag Mandir, two lake palaces. 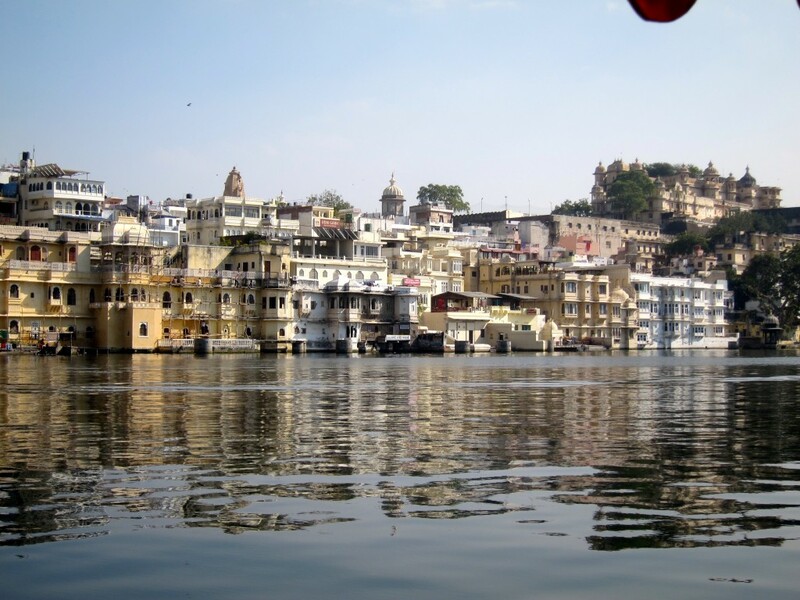 After I settled in my room on the ground floor with, unfortunately, no lake views, I asked concierge for a map and directions to the City Palace and embarked on a 9 hour tour around the palaces, lakes and temples. The City Palace was built concurrently by Udai Singh II in 1559 and his 76 successors Maharanas over the period of 300 years. 224 m long and 30 m high, it is the largest palace in India, and despite its enormous size, this conglomeration of eleven separate palaces and gardens, built and extended by various Maharanas, still remains incredibly uniform in architectural design and style. A rich blend of Rajasthani, Mughal, Medieval, European and Chinese architecture is distinctly homogeneous and eye catching. The palace complex was built entirely in granite and marble. The interiors of the palace with its balconies, towers and cupolas exhibit delicate mirror-work, murals, wall paintings , silver-work, inlay-work and colored glass. Nitin and I entered the front courtyard via Tripolia Pol (built in 1725), in front of the palace facade is an arena where elephant fights were staged in the past to test their prowess before starting on war campaigns. After giving me a brief history lesson about Udaipur and its maharanas, Nitin mentioned that luckily I came in the right time, because the current Maharana’s only son was getting married in two weeks time, so the palace has been cleaned, re-decorated to look its best for the festivities. 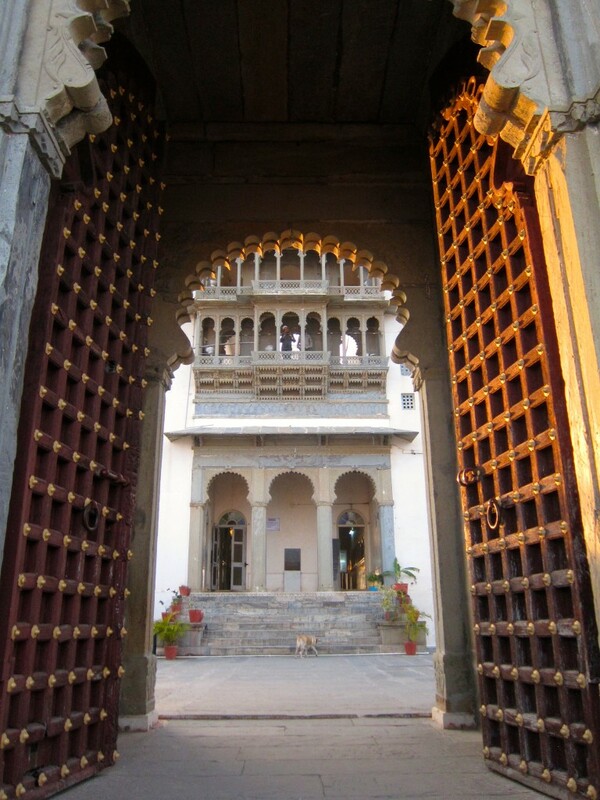 We approached the main block of the City Palace through a modest door from the Ganesha Deodhi Terrace. 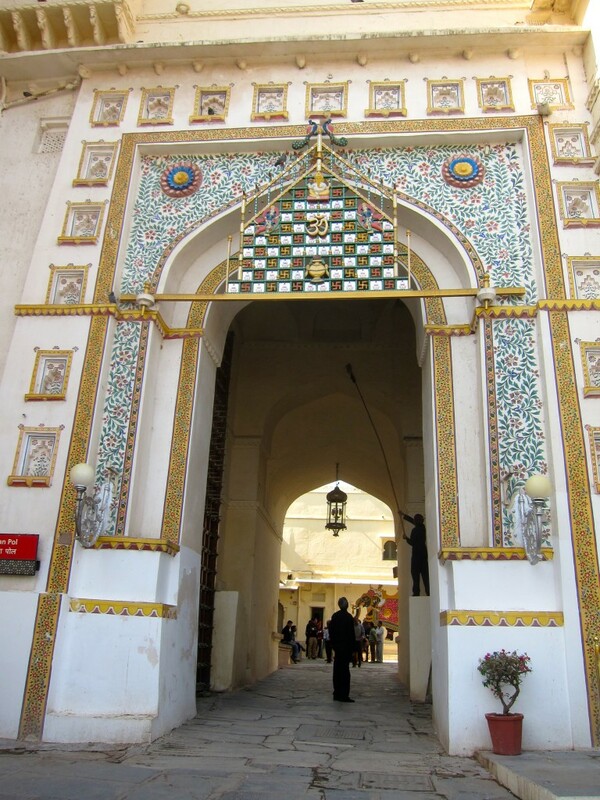 The door was flanked by whitewashed walls vibrantly painted with martial animals in the traditional Rajput style. Via Toran Pol, named after a traditional wedding ritual, where the groom getting married to the Mewar princess would touch the toran – a temporary crown tied on the entrance gate, we entered the City Palace Museum. Do not get confused, the main entrance ticket to the Palace allows you to enter only the front arena since the rest of the palace operates as a City Palace Museum and requires a separate ticket. First courtyard, Moti Chowk, was built during the reign of Rana Karan Singh Ji (1620-1628) and served as the arrival and departure hall for the royal family, as well as a place where elephants and horses were prepared for the royal processions. Adjacent, there are sites of Khasa Rasodia, original structure was known as Kanwarpada ki Ovari (living room for the prince), converted in the 19th century by Maharana Swarup Singh Ji into the special kitchen and Satanavari Paiga that literally means ‘seven and nine bay horse stable” built by Rana Karan Singh Ji in the 17th century, with five bays of the north block still functioning as horse stable. The City Palace Museum begins with the Rai Angan (Royal Courtyard), the very spot where hermit Goswami Prem Giri blessed Udai Singh and instructed him to build a new city. Rooms along the sides contain paintings (including the one of the Battle of Haldighati in 1576), armory, historical documents and the fire-pit dedicated to the hermit. 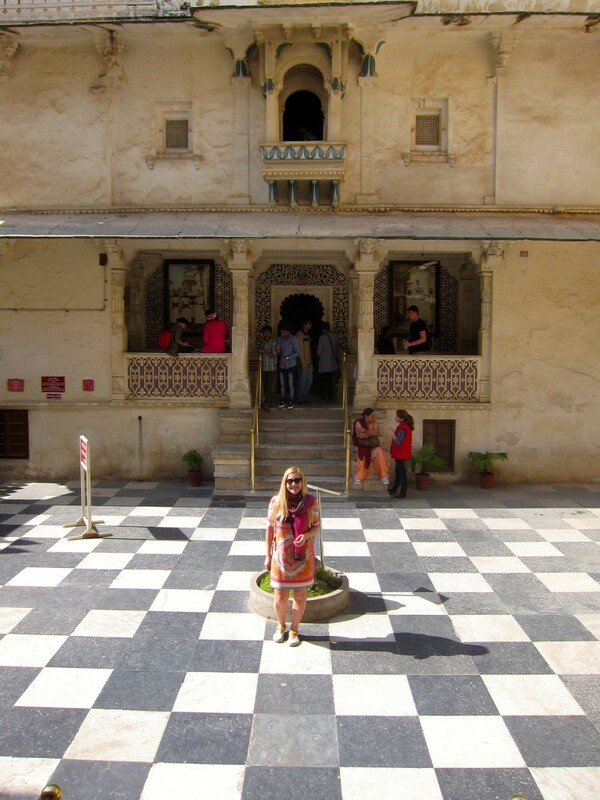 We moved on to Baadi Mahal (Great Palace), the exotic central garden palace situated on a 27 m high natural rock formation vis–à–vis the rest of the palace, where the rooms on the ground floor appear to be at the level on the fourth floor. The swimming pool in the middle was used for Holi festival celebration. 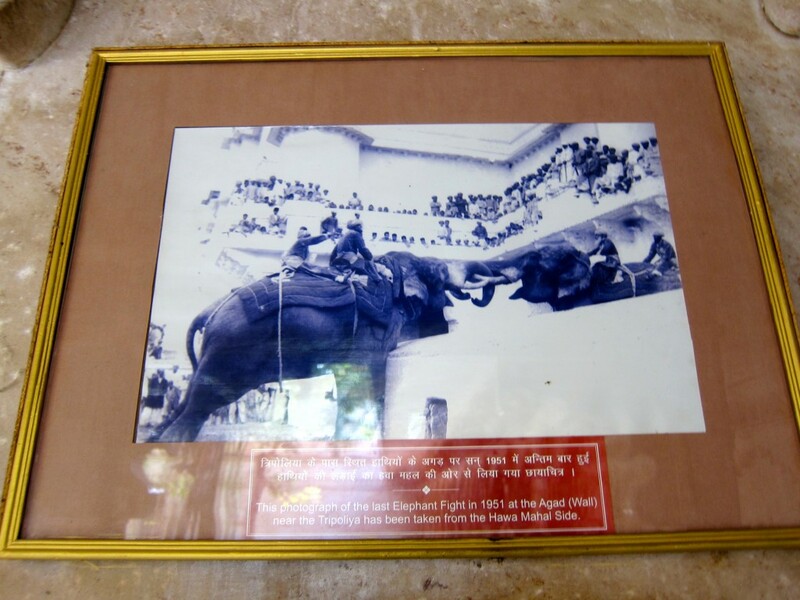 In adjoining hall, miniature paintings of the 18th and 19th centuries depict Jag Mandir, Jagdish Temple, the very courtyard and an elephant fight organized by the Maharanas. Because elephants are naturally very calm animals, they were fed hashish before arranging the flights. The fight looked like the two elephants pulling each other by the trunks. It might have seemed innocent, but on most occasions caused elephants deep tusk-inflicted wounds. Kishan (Krishna) Villa is another chamber in the Palace with rich collection of miniature paintings that portrays royal processions, festivals and games of the Maharanas. 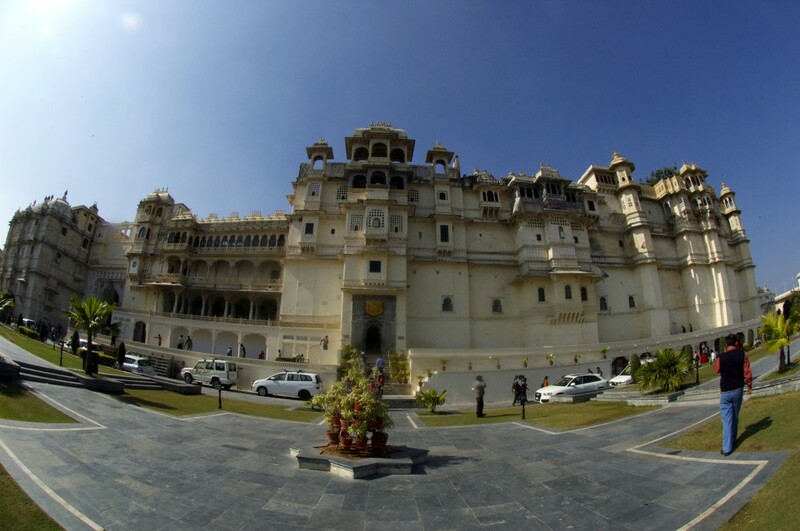 However, there is a tragic story linked to this wing of the City Palace – Bhim Singh’s daughter Krishna Kumari drank a fatal cup of poison here to solve the dilemma of two rival princely suitors from Jaipur and Jodhpur, who were both threatening to invade Mewar, if she didn’t marry them. 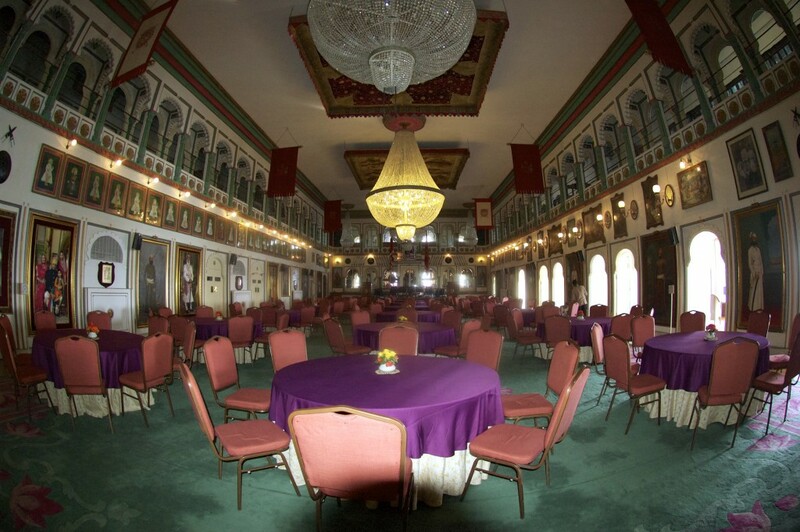 Approached from the Manak Chowk, Manak Mahal is an enclosure for rulers’ formal audiences and has a raised alcove inlaid completely in mirrored glass. Sun-faced emblems, in gleaming brass, religious insignia of the Sisodia dynasty are a recurring display at several locations in the City Palace; one of these prominent emblems is depicted on the facade of the Manak Chowk, which can also be seen from the outermost court below. The largest emblem is also seen on the wall of the Surya Chopra , a reception area at the lower level. Surya or Sun emblem of the Mewar dynasty depicts a Bhil, the Sun, Chittorgarh and a Rajput with an inscription in Sanskrit of a quotation from the Bhagavat Gita “God helps those who do their duty”. It was and still is customary for the Maharanas to offer obeisance to the Sun facing east, every morning before breakfast. Many chambers are former living quarters of the Maharanas, each representing a particular king’s style, needs and hobbies. One of the rooms belonged to Bhopal Singh (1930-1955) paralyzed from waist down since the age of 16, his room was equipped with an elevator and made fully accessible for a person in a wheel-chair. 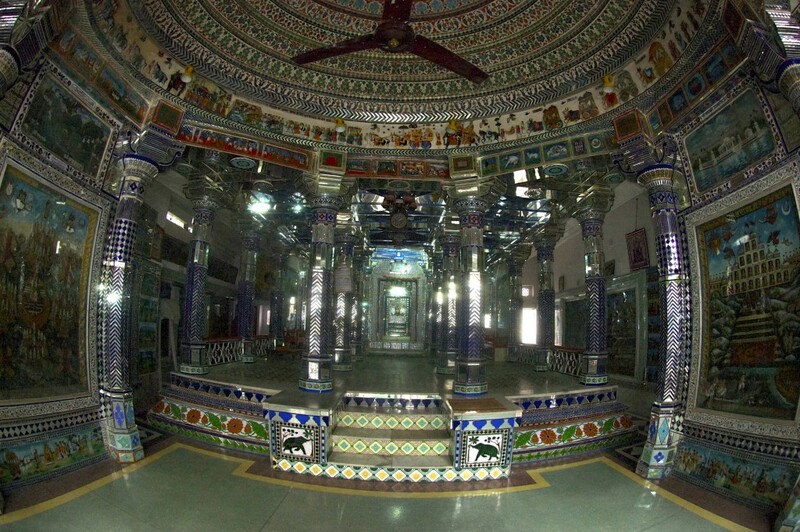 Surya Chopra opens into Mor Chowk (Peacock Courtyard) – a pillared hall with glass and mirror mosaic decorations which are integral to the inner courts’ style. The elaborate design of this chamber consists of three peacocks (representing the three seasons of summer, winter and monsoon) modeled in high relief and faced with 5,000 peaces of colored glass, built into successive niches in the wall area. The Mor Chowk was built by Maharana Sajjan Singh, 200 years after the construction of the palace. The all-mirrored Chitram-ki-Burj and Badi Chorur Chowk are great places to check out too. The south end of the Palace comprises of Zenana Mahal, the royal ladies quarters built in the 17th century. In 1974, it has been converted into a gallery and now contains lots of paintings depicting royal hunting scenes. Next to Zenana Mahal is Amar Mahal or the Treasure Hall built in the early 17th century by Rana Amar Singh I. Adjacent rooms contain the exhibit of old horse baggies and precious silver objects. It was almost 13.45 when Nitin finished the tour and rushed me to the Chandra Chowk Gate to get a ticket for a Pichola Lake boat ride. Apparently, tickets sold between 10.00 and 14.00 were Rs.340, while from 14.00 till 17.00 Rs.600. Since I already had the City Palace Entrance ticket, I didn’t have to buy another one, and after getting a boat pass, I said goodbyes to Nitin and ran to the Rameshwar Ghat to catch the last boat (which usually leaves every hour). The Ghat was about 15 minutes walk and I was lucky to make it on time. Pichola Lake was enlarged by Maharana Udai Singh II after he moved his capital to Udaipur. Now, it is 4 kms long and 3 kms wide and offers a fantastic way to see the city from a boat. 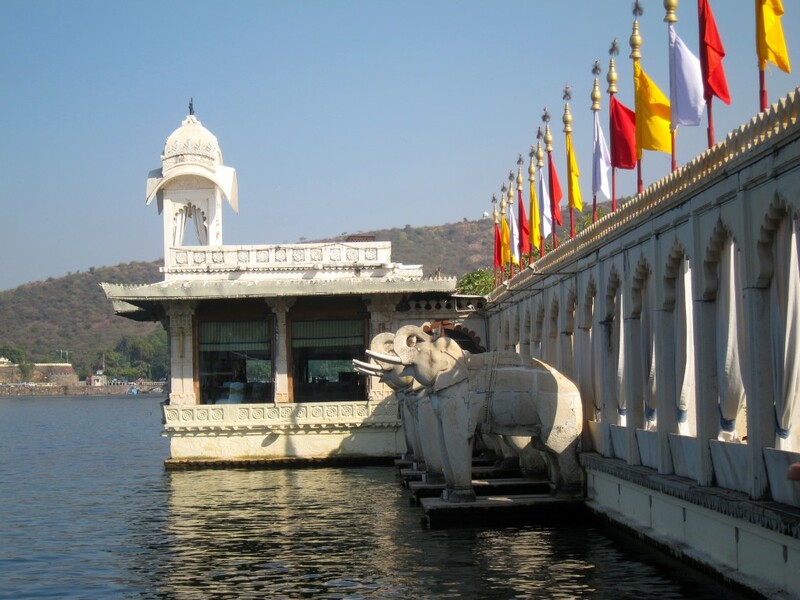 There are two natural islands in the Lake, Jig Niwas Island – home to the royal summer palace converted into the world-famous Taj Group-run luxurious Lake Palace hotel (which I didn’t visit) and Jag Mandir Island, where I took a boat trip. 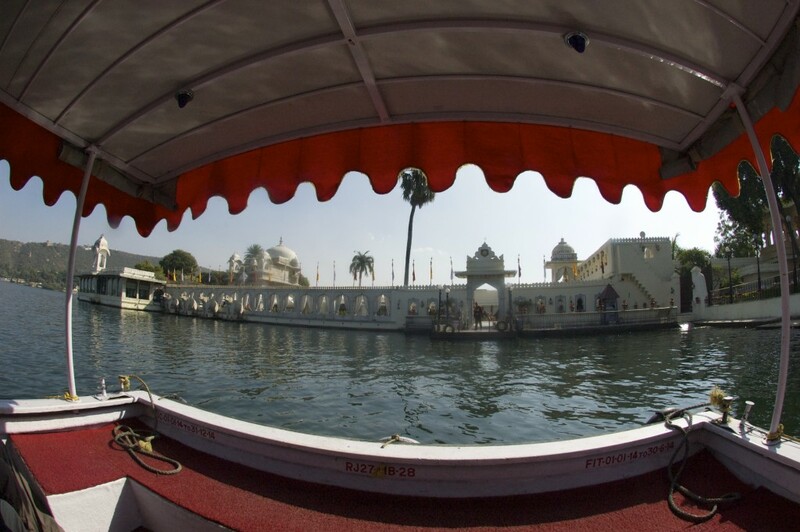 The city looked stunning from the water, built in different, yet coordinated styles, Udaipur looked nothing less than a postcard during the 40 minutes journey to Jag Mandir. Construction of Jag Mandir, also known as Lake Garden Palace, started in 1551 by Maharana Amar Singh, continued by Karan Singh (1620-1628) and finally completed by Jagat Singh I (1628- 1652). The palace’s history is closely related to the Mughal Emperor Shah Jahan, when he was still young prince known as Prince Khurram. In 1623, he rebelled against his father Emperor Jahangir claiming the throne of the Mughal empire. Faced with danger of getting thwarted in his campaign, he sought refuge in Mewar kingdom at Udaipur where he was given a refuge by Maharana Karan Singh (they say that the courtesy was extended because Khurram’s mother was a Rajput lady). Initially, Khurram, his wife Mumtaz Mahal and two sons, Prince Dara and Prince Aurangzeb, stayed at the City Palace, but later they were moved to Gul Mahal, a palace especially built for Khurram by his host in the middle of the Jag Mandir island, where Khurram remained under Mewar’s protection in 1623-1624. The irony of this act of hospitality is that Karan Singh’s father was defeated by Khurram in the war in 1614, and his son, Karan, had acted an envoy to the Mughal court where the cordial amity developed between the Mewar and Mughal kingdoms. Following the death of Jahangir in 1627, Khurram bestowed the title of Shah Jahan at the Badal Mahal in Udaipur, before he left for his coronation as the Mughal Emperor. As the reward, Shah Jahan not only restored six, previously annexed by Mughals, districts to the Mewar kingdom, but also presented a unique ruby jewel to Jagat Niwas, son of Rana Karan Singh. During the Indian Mutiny of 1857, the island became a refuge for the second time, when Maharana Swroop Singh saved a number of European families, mostly women and children, from imminent death from the Indians, by hiding them in the Jag Mandir palace. You can’t deny that Jag Mandir is impeccably beautiful and manicured island with two separate palaces, Gul Mahal and Jag Mandir, a garden and a pavilion; it is home to an amazing restaurant and a seven-room boutique hotel. We docked the boat at the Pavilion, an impressive white colonnade of cusped arches, decorated with large elephants carved in stone, four on each side of the entry steps. The first structure I visited getting off the boat was Gul Mahal. Initially built as a small sandstone palace in 1551, during the reign of Maharana Amar Singh, it was further developed to host Prince Khurram. The Gul Mahal has three circular domed chambers, one above the other, with a crescent of Islam fixed on top of the dome. The columned hall lead to the living chambers where the massive marble slabs affixed to the interior walls were inlaid with colored rubies, onyx, jasper, cornelian and jade. This type of decoration is reported to have been replicated by the Mughals in their Tomb of I’timād-ud-Daulah at Agra, in 1626. The palace is also said to have housed a throne carved from a single block of serpentine, which is presently not traceable. 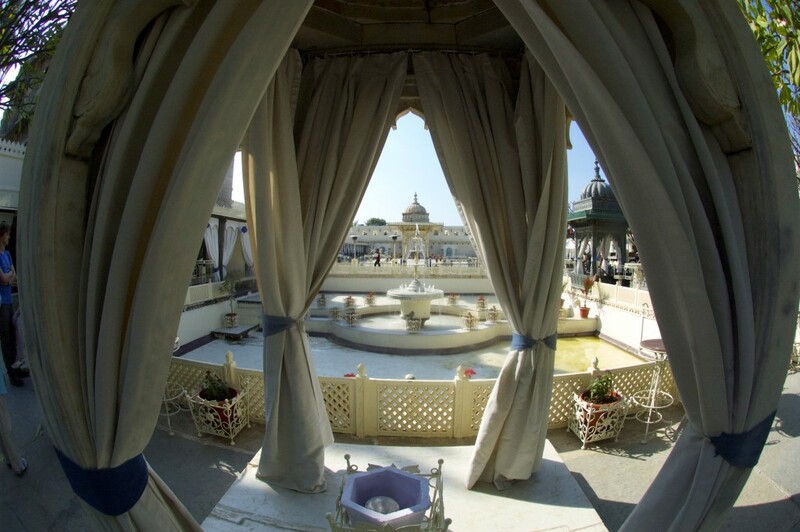 The Mahal is surrounded by a roomy circular apartment built in white and black marble with murals and paintings considered an uncommon feature in Rajput architecture. On the western wing of the palace, this type of design has been repeated in three other pavilions. Jag Mandir is the main palace which incorporates the Gul Mahal. It has octagonal towers topped with cupolas and houses a labyrinth of reception halls, residential apartments and internal courts, all built in Rajput and Mughal style. The Zenana and Kunwar Pada ka Mahal (The Palace of the Crown Prince) adjoint the palace. Access to the second floor was prohibited, but the main hall represented a very interesting and well assembled historical museum of the Palace and island. A group of Russian tourists was on the boat with me, and because they didn’t speak English, for 30 minutes I had to play a guide and translate every plaque posted in the museum. Gardens and Palace of the Twelve Stones are other two things to explore on this small island, but I preferred to order a glass of wine and enjoy the views of the lake and the city, as well as the fabulous dining pavilion. Once you are on Jag Mandir Island, you can stay as long as you want and take any boat heading back to Udaipur. I stayed for over an hour and met two interesting Argentine guys, Nico and his friend, who I ran into a few more times on my trip around Rajasthan, since we were visiting the same cities at the same pace. After getting back to Udaipur, I stopped by Fateh Prakash palace, which is now a luxury heritage hotel hosting two very interesting sites – Durbar Hall and Crystal Gallery. After paying Rs. 525 for a combined ticket (Crystal Gallery and a tea/coffee ceremony) and leaving my driver’s license as a deposit, I went on exploring the hotel’s premises. Durbar Hall, built in 1909 within the Fateh Prakash Palace is one of India’s largest and most extravagant royal reception halls, lit by some of the country’s biggest chandeliers. The luxuriant interior is decorated with weapons of the Maharanas and some of their unique portraits. The gallery above the the hall was used by the royal ladies to observe the court proceedings. I was the only person in the hall and judging by the busy staff running back and forth, they were getting ready for some important function. I have heard from my guide that the rent of this room starts at $40,000 per day. Before I entered the Crystal Gallery, I deposited all my cameras and a phone, since no pictures were allowed in the Gallery. Maybe because of its hefty, by Indian standards, entry price the Gallery was empty, only the voices of two guards at the door, continually bickering with each other, were heard throughout the entire hall. The audio guide was very useful in telling the story of the gallery and origins of some of the peaces. The gallery houses a rare collection of crystal that Maharana Sajjad Singh ordered from F&C Osler & Co in London in 1877 but died before it arrived. It is said that all the packages and boxes containing the crystals remained unopened for 110 years and when they were finally re-discovered, the current Maharana didn’t want to use the objects but built a permanent exhibition showing the best of the items. Now, the gallery consists of crystal chairs, dressing tables, sofas, beds, thousands of pieces of crockery and table fountains none of which was every used. After finishing the tour, I was escorted to the Gallery Restaurant where I sat by the window, imagining a life of a Mewar princess while waiters served me coffee with cookies. After exiting through the City Palace’s Badi Pol, I visited Jagdish Temple, a large Hindu temple built by Jagat Singh I in 1651. After climbing elephant-flanked flight of 150 steps and fighting off the herds of men pretending to be the apprentices of the school of miniature painting across the street (a very common trick in Udaipur), I got to enjoy a few moments admiring wonderfully carved double-storied mandapa enshrining a black stone image of Vishnu as Jagannath, lord of the Universe and his man-bird vehicle Garuda. It was starting to get dark and I was quite exhausted, but there was one thing I wanted to do before calling it a night. I phoned Sunil to come and pick me up by the Temple and after about 15 minutes, we were already on the way to Sajjan garh or Mansoon Palace. Located 9 kms by the winding road, on top of Aravalli hills overlooking Pichola Lake, this melancholy and neglected white marbled palace was built by Sajjan Singh in 1884. It was originally planned to be a nine-storied astronomical center, but after Sajjan Singh prematurely died at the age of 26, the partially built palace was subsequently completed by his successor Fateh Singh who used it as a monsoon palace and a hunting lodge. The white marble palace (Rs. 160 + Rs 130 for a car) has high turrets and guards regulating each of the towers. The palace has a grand central court with a staircase that leads to many rooms and living quarters. 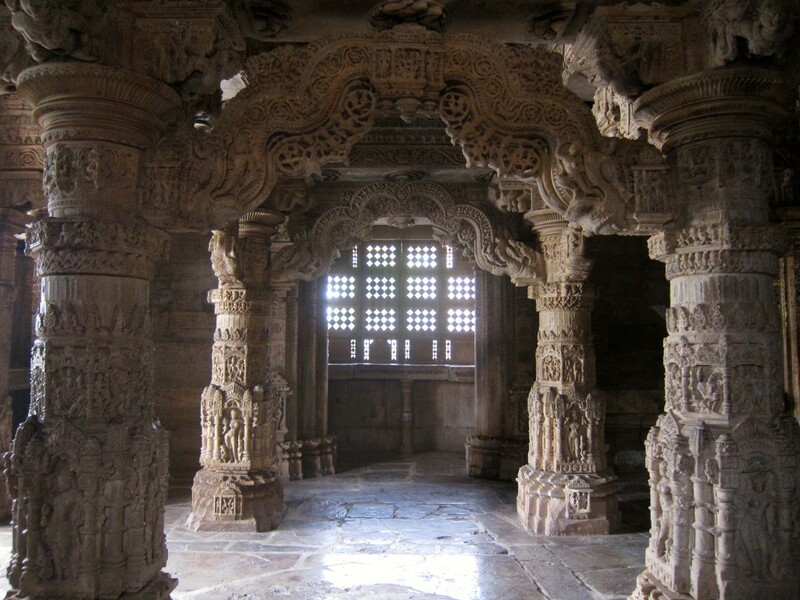 It has been built on marble pillars, which have been carved with exquisite motifs of leaves and flowers. The Mansoon Palace has a unique rain water harvesting structure with storage capacity of 195,500 litres, however, it wasn’t adequate to sustain the palace and it was therefore abandoned. In 1956 Maharana Shri Bhagawat Singh gave Mansoon palace to people of Mewar, perhaps it explains the neglected state of the Palace and its weird Wildlife Sanctuary exhibit inside the main hall. 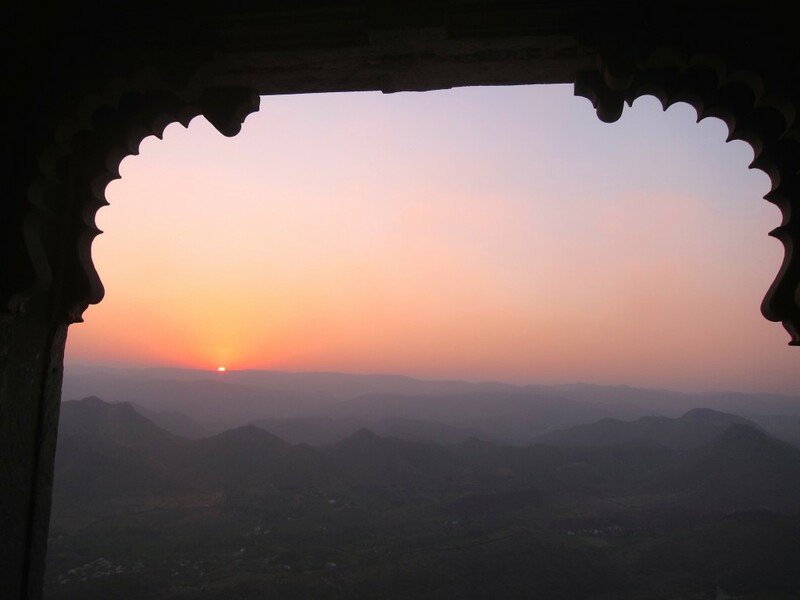 I did come to check out the palace, but more importantly, I came to witness the glorious end of the day with the sun setting behind the Aravalli range. After a delicious dinner at the restaurant located in my hotel, with a wonderful views of the lake and a bunch of noisy patrons, I finally went to sleep. 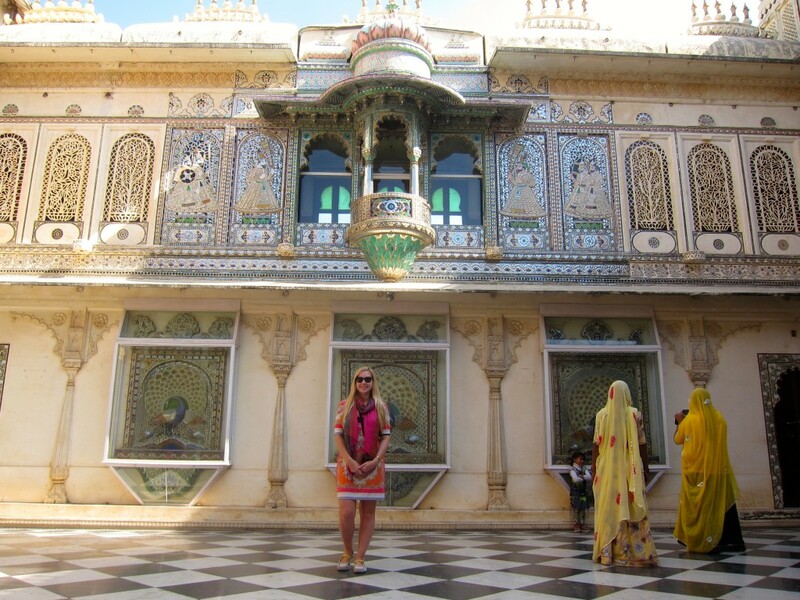 I spent the entire previous day checking out the sites of Udaipur and with relative success, taking my time, I succeeded to see most of them. Today, I asked Sunil to take me to a few other sites that are located within 20-30 kms from Udaipur, namely Sas-Bahu Temple and Eklingji Temple. I met Sunil outside the city walls at 9 am and we headed to Nagda, the old capital of Mewar kingdom, even before it moved to Chittorgarh in 734 A.D. In ancient times, Nagda was known as Nagahrada founded by Nagaditya, the fourth Mewar king, who ruled in 646 A.D. 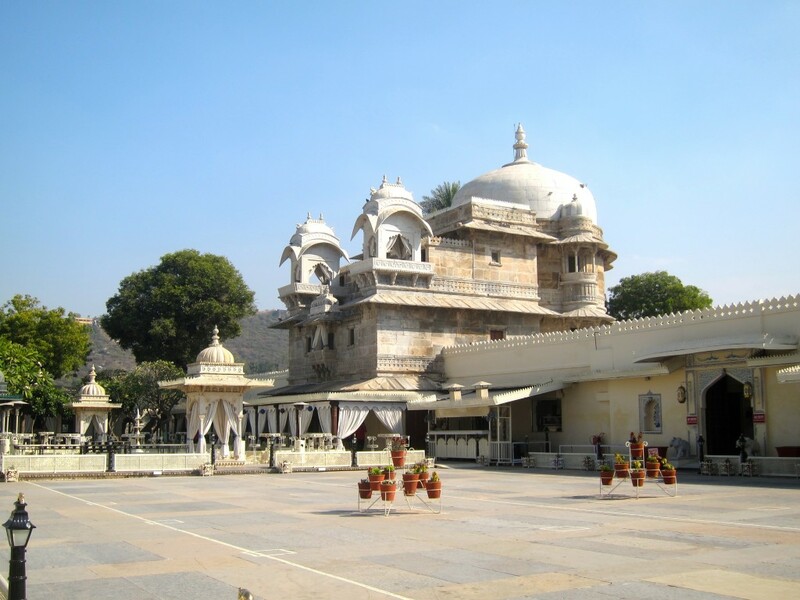 It was a flourishing town studded with Shiva, Vaishnava and Jain temples. In the 15 century, the Guhila king Mokala, constructed a large lake naming it after his brother Bagela Singh. There are several temples around the lake, but the most famous one is Sas-Baku Temple. 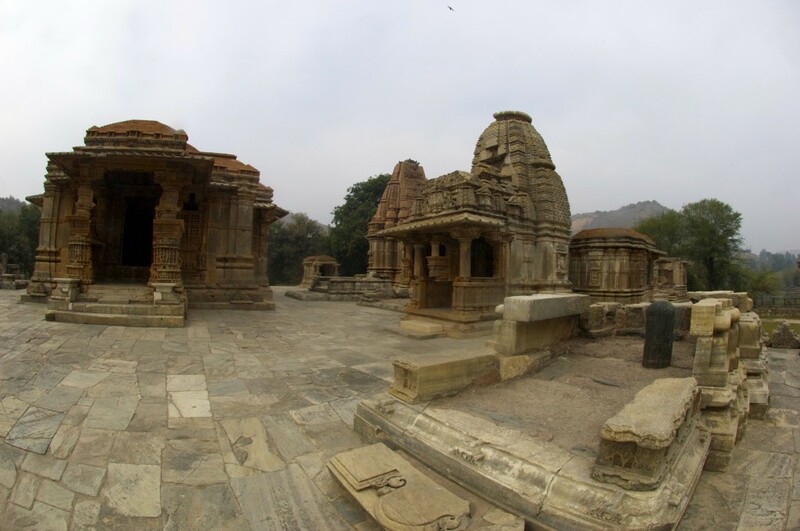 The temples were built in the 10th century and Sas-Bahu means “Mother-in-law” and “daughter-in-law” respectively. The temple is dedicated to Lord Vishnu and consists of two structures – one by mother-in-law large structure and one by daughter-in-law smaller structure. Both temples are similar in construction, have an altar, a mandapa (columned prayer hall) with projections and a porch. The larger Sas Temple has a torana (archway) in its front and it is believed that on ceremonial occasions the image of the Lord Vishnu was swung from the torana accompanied by hymns in the praise of lord. 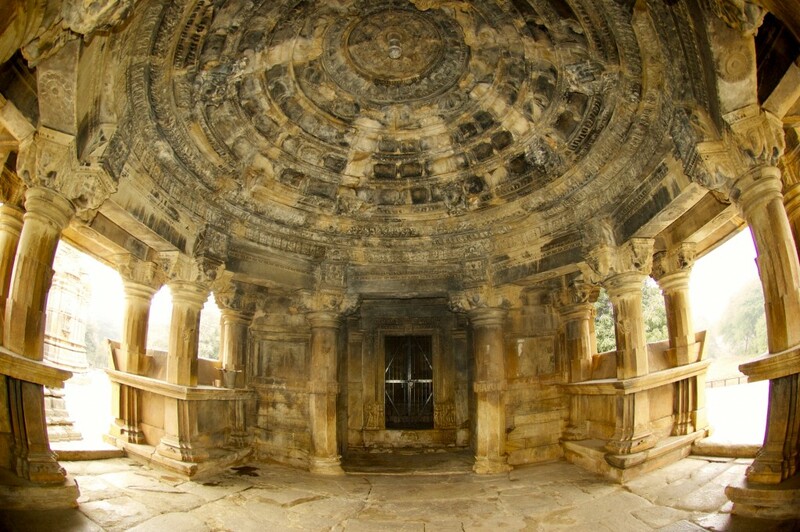 The smaller Bahu Temple has an octagonal ceiling which is adorned with beautifully carved eight intricate female figures. Both temples are built on the high platform facing east and each of the temples is surrounded by subsidiary smaller shrines – ten around Sas Temple and five around Bahu Temple, all decorated with astonishing carvings. The walls of the shrine are bare and not engrossed with much decor, but the projections with their exquisite sculptures are mind blowing. The sculptures are made in two steps, first, the images of Shiva, Vishnu and Brahma were carved and then, images of Rama, Balarama and Parashurama were added. The detailed relief figures include male and female deities, regents, amorous panels and scenes from Ramayana. Some temples were better preserved than others, but the entire Sas-Bahu Temple complex was something to explore, especially because there was no one around that early in the morning, not even a guard. On the other side of the lake, Sunil dropped me off by the Jain temple Adbhut ji Ka Mandir dedicated to Saint Shanti Nath, built during the reign of Rana Kumbha. 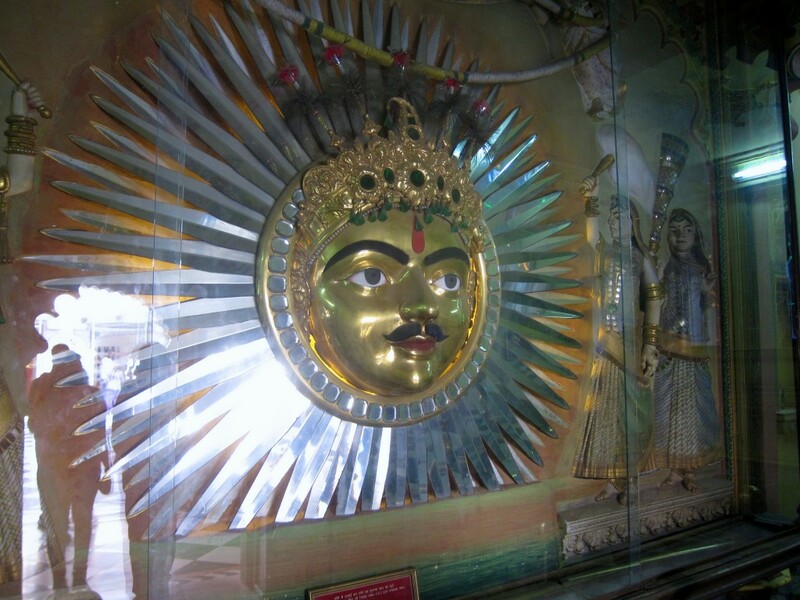 “Adbhut” means “strange” and it refers to a strange 9 feet idol located inside the temple. When I arrived, the temple was under a full-throttled construction and unless the black ordinary looking sculpture I found inside was the “strange idol” people were talking about, I didn’t find anything interesting to see there. However, on the way out, the construction workers showed me the other, smaller temple which surely served as a substitute to the one under construction. The attendant showed me around what looked like a regular Jain temple with statues of naked saints sitting in the lotus position, except for one thing – in the middle of the room hung a huge bell with Russian inscription “Трудовая Слава 1965” which means “Glory to the Workers” made it 1965. 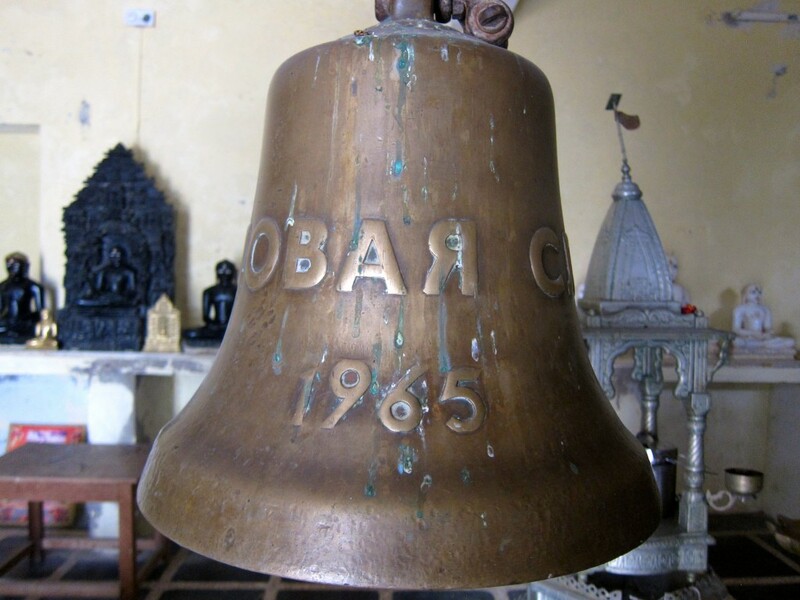 I could have never imagined a Soviet factory or farm’s bell in the India’s Jain Temple. Soviet leaders would have flipped in their caskets had they known that the “no religion” trick didn’t work out. What an irony. Both places took me about an hour to see, and now we were going to Eklingji – a Hindu complex of 108 temples. 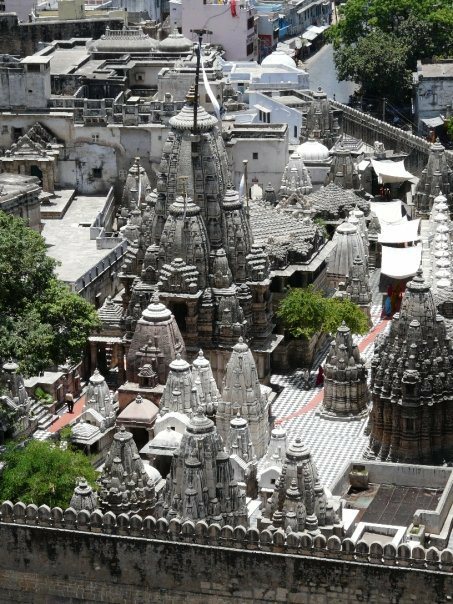 The temple complex was built by the Guhila (later called Sesodia) dynasty of Mewar in 934 A.D., in honor of their presiding deity Eklingji (which believed to be the ruling deity of Mewar), in a form of Lord Shiva. 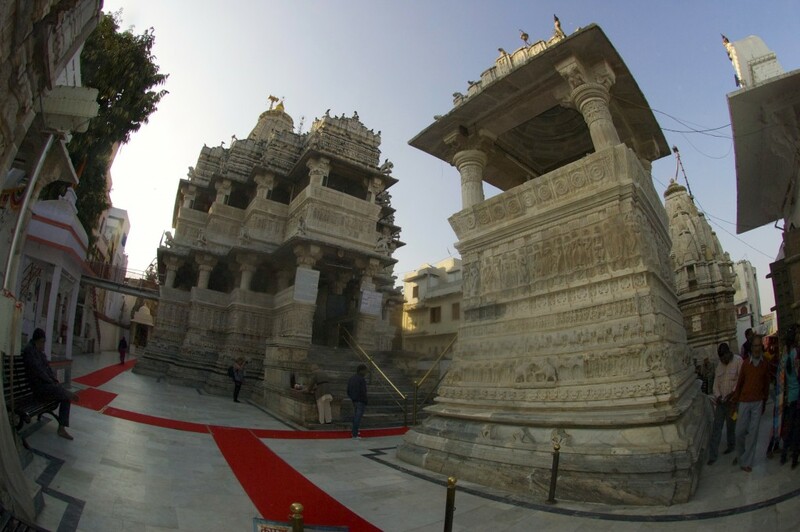 The beautifully sculpted temple complex is surrounded by high fort-like walls. The main temple, which dates to the 15th century, was rebuilt from the ruins of an earlier destroyed temple. The walled complex is made of marble and granite and has an enormous double-storied, elaborately pillared hall (mandapa) under a vast pyramidal roof, with a four-faced image of Lord Shiva in black marble. Another temple in the complex is the Lakulish Temple; built in 971, it is the only temple of the Lakulish sect in the whole of India. I deposited my cameras, shoes and SOCKS in the locker and went inside. It was very cold, about 0C, but the marble floor of the complex was covered with red carpet making it more or less comfortable to walk and explore this very densely built complex. I didn’t count whether there were indeed 108 temples, but there were a lot of them, tightly packed into one city block. I wish I have hired a guide because after about 10 minutes, all temples blended in together. Nevertheless, it was a stunning place to explore. * Photo was taken from the Internet. By noon, we were already on the way back to Udaipur. 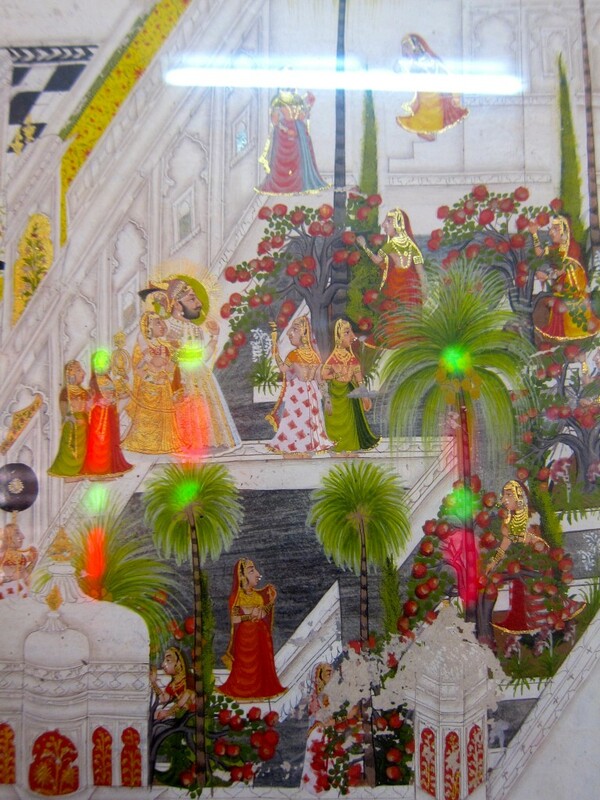 Sunil suggested to visit Saheliyon-ki-Bari, a so-called “Garden of Maidens”. I am not a big garden person, unless I am in Japan or China where each garden is a piece of art, but since I had plenty of time, i decided to give it a try. 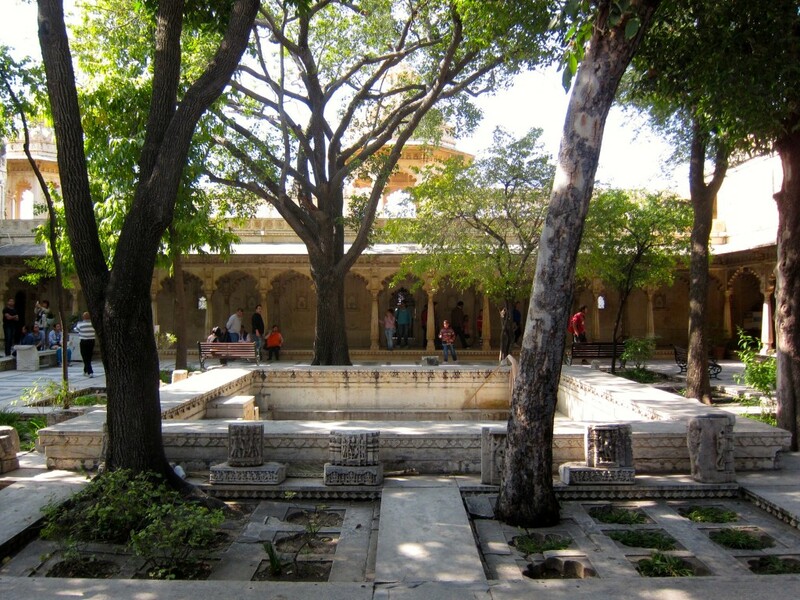 Designed and built by Maharana Bhopal Singh in the 18th century, the garden served as a leisure and relaxing spot for the Rani and her 48 young female attendant who accompanied a princess to Udaipur as part of her dowry. 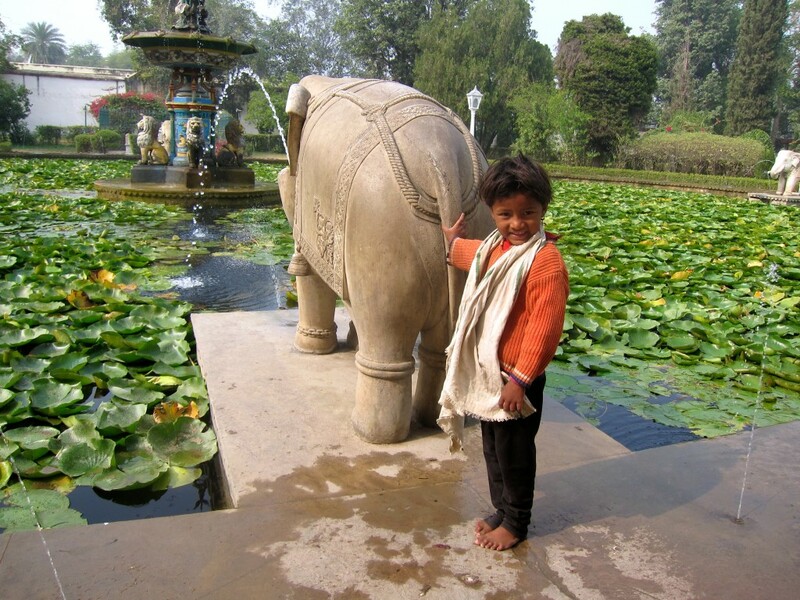 There are four water pools decorated with multiple fountains each of which “sings” in its own way; marble elephants and birds, along with the lotus pond apparently were very popular with locals too. There was a small hideous museum in the center of the garden, designed after Ripley’s “Believe it or Not Museum That Went Terribly Wrong”. My attention attracted a young, 5-6 y.o. girl, playing on the steps of the museum with a dirty piece of clothes. It wasn’t a doll, it was a thread of fabric. She looked very pre-occupied trying to put her rag to sleep, then cuddling it etc. I didn’t expect her to speak English but I asked an Indian couple to check with a girl if she was there with somebody or if she was homeless, because she did look like one but in India, many children look like homeless. They asked her and she said that her mom was a gardner at the Saheliyon-ki-Bari. I guess she brought her daughter to work but didn’t keep an eye on her because she was nowhere to be seen. I never found out her name, but I asked her whether she wanted to walk in the park with me and take pictures of the fountains and flowers, and she happily grabbed my hand and led me to the lotus pond. This little pure soul was a true delight to be with and a real model when it came to taking pictures, since she wanted to be in the every single one. We spent over an hour walking together, holding hands and inevitably attracted attention of other garden visitors, who would stop and stare. When I finally explained to her that I had to leave, she found the most beautiful flower in the garden and brought it to me. I was touched and hurt to leave. I looked into my backpack, trying to see if there was something I could leave with her, but all I had was a Lonely Planet travel guide and an apple. So, I gave her an apple and she gave me a huge hug in return. When I left the garden, I found my car surrounded by homeless children, many were barely 5-6 y.o. There was a girl, perhaps 4 y.o or younger, a toddler herself, carrying a wrapped new born baby. I gave all of them some little money, which I usually avoid doing since it stimulates the beggars’ ‘industry’, and even more children started to run from all over the place. I jumped in a car, closed the door and was about to drive away, but then I remembered that I had a pretty pink hair pin in my make up bag which I kept in a car. I asked Sunil to stop, found the pin and gave it to that little girl with a baby in her hands. Money did make her happy, but this little gesture of kindness, made her shine! I could see her waiving us goodbye till the car turned around the corner. It was still afternoon, so after Sunil left me by the city gate, I walked along the lake ghats, taking pictures of the phenomenally beautiful views of the lake and surrounding buildings, bridges, shops and daily life of Udaipur citizens. Without looking at the map, I simply browsed around the old town, checking out jewelry and souvenir shops, as well as buying famous Indian body oils. Next to the City’s Clock Tower, I spotted a very interesting looking temple, which turned out to be Vasupoojyaji Temple. The attendant sitting outside on his chair not only allowed me to go inside, but also accompanied me with the stories of the paintings depicted on the temple’s walls, and there were a lot of things to talk about. It was decorated with colorful glass and mirrors from top to bottom, making it look surreal and rich. Multiple paintings in the front hall depicted stories from famous Indian legends and I wish I wrote them down, because I can’t recall any one of them. I tipped the attendant Rs.200 for being super nice and friendly and for spending a good 30 minutes showing me every corner of the Temple. After finishing shopping, I returned to the hotel to pack my suitcase and get ready for an early-morning departure. 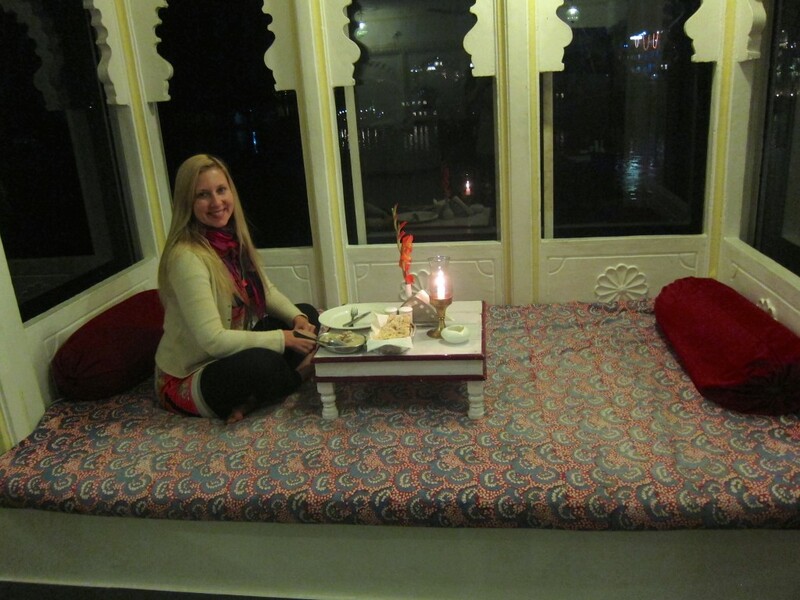 For the last time, I climbed the stairs to the hotel’s rooftop restaurant that offered, in my opinion, the best food in Udaipur and the best views of the lake too. Even though, the restaurant’s service was mediocre, I let it slide this time. This entry was posted in Asia and tagged Adbhut ji Ka Mandir, Agra, Akbar, Amar Mahal, Amar Singh I, Aravalli range, Argentine, armory, Baadi Mahal, Badi Chorur, Badi Mahal, Balarama, battle of Haldighati, beggar, Bhagavat Gita, Bhil, Bhopal Singh, Bhupal Singh, boat, boat trip, Brahma, British, camera permit, Chandra Chowk Pol, children, Chinese, Chitram-ki-Burj, Chittorgarh, Chittorgarh fort, City Palace, City Palace Museum, Clock Tower, Crystal Gallery, Durbar Hall, Eklingji temple, Elephant, elephant fight, emblems, F&C Osler & Co, Fateh Prakash Palace, Fateh Sagar Lake, Fatehprakash Palace, flowers, fountains, gallery, Ganesha Deodhi Terrace, Garden of Maidens, garuda, Goswami Prem Giri, Guhila, Gul Mahal, harem, hermit, historical documents, Holi, homeless, India, Indian Mutiny, Indian Rebellion, Jag Mandir, Jag Niwas, Jagannath, Jagat Niwas Palace Hotel, Jagat Singh I, Jagdish Temple, Jahangir, Jain, Jaipur, jewelry store, Jodhpur, Khasa Rasodia, Kishan Villa, Krishna Kumari, Krishna Villa, Kunwar Pada ka Mahal, Lake Garden Palace, Lake Palace, Lake Palace Hotel, Lakulish, Maharana Pratap, Manak Chowk, Manak Mahal, Mansoon Palace, Maratha, Mewar, Mor Chowk, Moti Chowk, Mughal, Mumtaz Mahal, museum, Nagaditya, Nagahrada, Nagda, paintings, Palace of the Twelve Stones, Parashurama, Peacock Courtyard, Pichola Lake, pond, poverty, Prince Khurram, Rai Angan, Rajasthan, Rajasthani, Rama, Rana Karan Singh Ji, Rana Kumbha, Rana Udai Singh II, roof-top restaurant, royal hall, royal wedding, ruby, Russian, Saheliyon-ki-Bari, Sajjan Garh, Sajjan Singh, Sas-Bahu Temple, Satanavari Paiga, Shah Jahan, Shanti Nath, Shiva, Sisodia, Soviet, sun, Surya, Surya Chopra, Swarup Singh Ji, Taj, Taj Hotels, The Palace of the Crown Prince, ticket, Tomb of I’timād-ud-Daulah, toran, tresury, Tripolia Pol, Udai Singh II, Udaipur, Vaishnava, Vasupoojyaji Temple, Vishnu, zenana. Bookmark the permalink.